Nothing signals spring at Trevena Cross like the inaugural journey of bedding and patio plants from nursery to garden centre. A short ride down the lane from the huge tunnels in the nursery where they’ve been growing, the first of thousands of bedding and patio packs have arrived on the garden centre. It’s a lovely time of the year, when there’s a colour explosion on the garden centre and excitement builds for visitors, as the possibilities for planting in pots, troughs, baskets, beds and borders really opens up! “The best thing about, particularly our huge range of patio-4 packs, is that they offer colour for such a long period of time; from spring continuously right through to Christmas, or beyond if winter temperatures are kind. 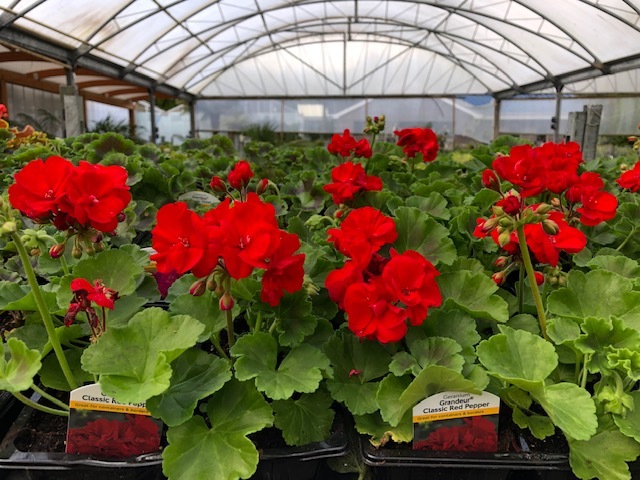 When you consider that your average shrub or perennial may only give you 6-8 weeks of colour each year, these patio plants really are a great investment, at just 77.5p per plant! Simply make sure that there are good drainage holes in your container, use great compost (we use and recommend Humax or Sylvagrow), add a little slow release fertiliser, and keep well-watered for a wonderful flowering display all year long”. With a huge range of choices to consider when purchasing your plants for patio colour this year, be sure to take advantage of the encyclopaedia of knowledge on hand from us here at Trevena Cross too, should you need it during your decision making – we’re always happy to help!